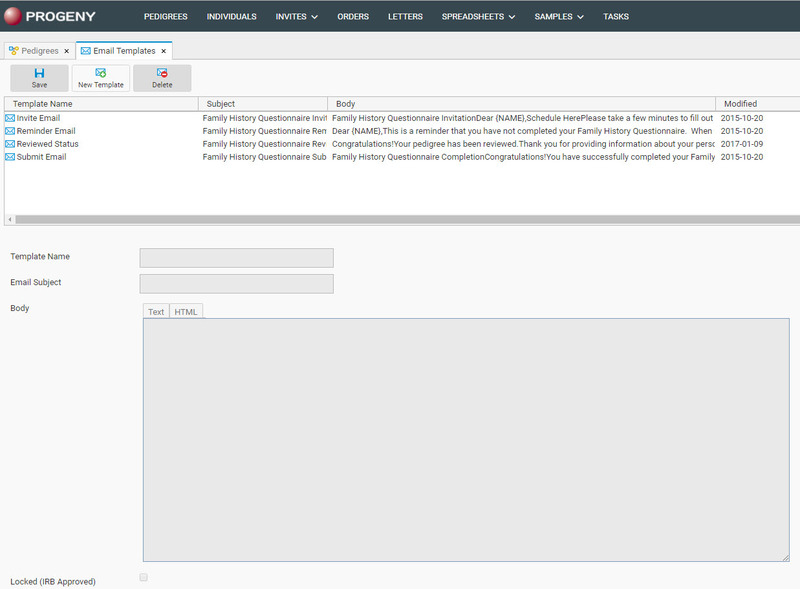 The email templates for the Family History Questionnaires (FHQ) are saved in this module. Invitation Email – the template that is used for sending invitations. Submit Email – the template that is used to acknowledge when a questionnaire is submitted by patients. Unfinished Email – the template that is used to remind a patient that a questionnaire has not been completed. Locked (IRB Approved) – indicates that the email template has been reviewed by your organization’s Institution Review Board (IRB). There are also additional options at the top of the Email Templates page. Save – saves any changes made to any of the email templates. New Template – creates a new email template. Delete – deletes an email template.